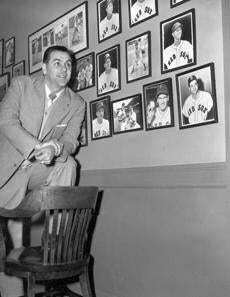 New Red Sox manager Lou Boudreau took his place in Fenway Park on Dec. 1, 1951. Dom DiMaggio slid home with an inside-the-park home run against the White Sox on June 24, 1951. Ted Williams hung up his jersey for the final time before rejoining the US Marine Corps on April 30, 1952. Williams spoke to the crowd that day before reporting for military duty. 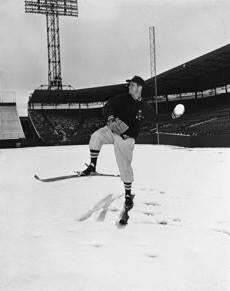 When the Red Sox were snowed out on April 14, 1953, Mel Parnell pitched snowballs instead of baseballs. Boston University product Harry Agganis, left, debuted with a flash for the Red Sox in 1954, but died at age 26 the next year of a pulmonary embolism. Snow blanketed Fenway Park on this 1955 day. Fenway Park was full for Opening Day in 1956 against the Orioles. There was a wide swath of empty seats in left field on Aug. 11, 1956. Grounds crew workers laid down new turf in 1957. 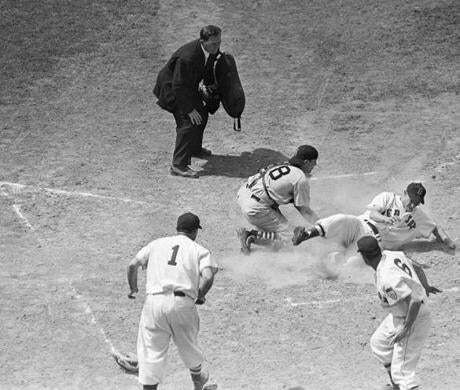 Ted Williams slid safely into second base in this game against Kansas City on July 25, 1957. Members of the Topsfield girls softball team attended a clinic sponsored by The Boston Globe on April 26, 1958. Pumpsie Green, second from right, with (from left) Frank Malzone, Don Buddin, and Pete Runnels, was the first black player to play for the Red Sox in 1959. Several thousand kids watched the May 12, 1959, game at Fenway Park as guests of The Boston Globe, Red Sox, and the auto dealers of Greater Boston. The seats were empty, but the Red Sox were in Fenway Park for batting practice on May 19, 1959.